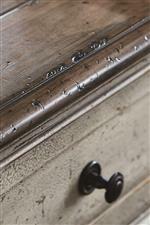 Protect drawer interiors as well as fragile items when a piece is fitted with a felt liner. As you open and close drawers, small items can be easily tossed around. The texture of the felt liner helps eliminate movement and protects drawer interiors. 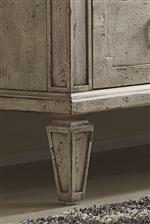 Detailed antiquing, decorative molding and a trendy two-tone finish work together to create the farmhouse chic look you've been dreaming of. This dresser features eight soft closing drawers including a felt-lined top and cedar-lined bottom drawer for your storage needs. 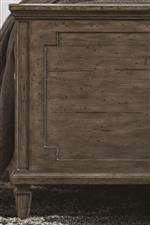 The Verona Rustic Dresser with Felt and Cedar Lined Drawers by Bassett at Fisher Home Furnishings in the Logan, Bear Lake, Cache Valley, Ogden, Salt Lake City, Utah area. Product availability may vary. Contact us for the most current availability on this product. Storage Eight drawers total with felt-lined top drawers and cedar-lined bottom drawers. All drawers are soft closing.